Can mashups be used to make high school students interested in studying computer science? To answer this question, we have designed the mashup atelier. The goal of this experimental lecture is to make students realize that the Web is not only a medium for passively consuming information but it can be actively reprogrammed as they see fit. The atelier introduces the topic of Web 2.0 Mashups to students without any formal pre-existing computer science education. After giving the atelier several times, we report on the results of a student evaluation survey showing that, if supported with right kind of mashup tools, creative students can become very productive developing interesting mashups in a short timeframe. 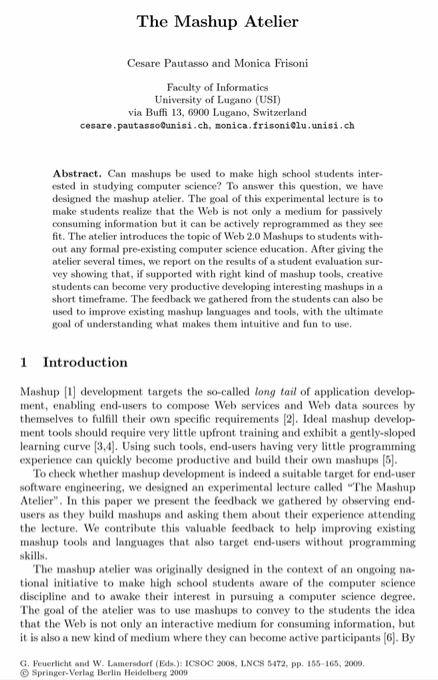 The feedback we gathered from the students can also be used to improve existing mashup languages and tools, with the ultimate goal of understanding what makes them intuitive and fun to use.